Yeah, sorry but it’s all true. Wait…before I continue, ya’ll need to see this! It’s the latest shiny beautiful wonderful spot from Monsieur Igloo! It was yet another amazing team effort that I am immensely proud of, even though most of the hard work was done by pretty much everyone but me (and most of it was done by the ridiculously talented writer/director). So, ok, now we have a beautiful new place to live with a lovely kitchen that I often gaze upon lovingly/smear chocolate on by accident. But it was pure Hell getting to this place. It. Was. Hell. There was the paperwork and the interviews and the U-Hauling and the moving and arranging and boxing and carrying and not dropping and GETTING BITTEN IN THE FACE MULTIPLE TIMES BY MOSQUITOES and the venting to people who had generously (and bravely) offered to help and the unpacking and the moving and just the anxiety of it all. Oh, and it all happened the week before my birthday, which depresses and inexplicably freaks me out anyway. Oh, and it’s not my age that freaks me out so much as my dismay at having gone another year without accomplishing a lot of the things my fat baby self had imagined I would by this age. That’s something that I’m still struggling with, and maybe will always kind of struggle with. I don’t know. I have a nice apartment and a TEE-rific person to share it with and I’m still breathing. So maybe let’s stop talking now and make some pumpkin muffins, yeah? Now, originally, these were going to be doughnut holes. Rhea Mol had sent me the recipe after she’d successfully (as if she’s never succeeded, girl’s a genius, duh) made these as minis. I made these right before we had moved and had to make do with a regular-sized muffin tin. Now, I would never ever complain about having larger versions of small desserts, but if you’re looking for the real deal, try a mini-muffin tin instead of a regular one. Full disclosure: The original recipe also adds a coating that involves a stick of butter and some other stuff. I was not down for that, but if you are, have at it, comrade! 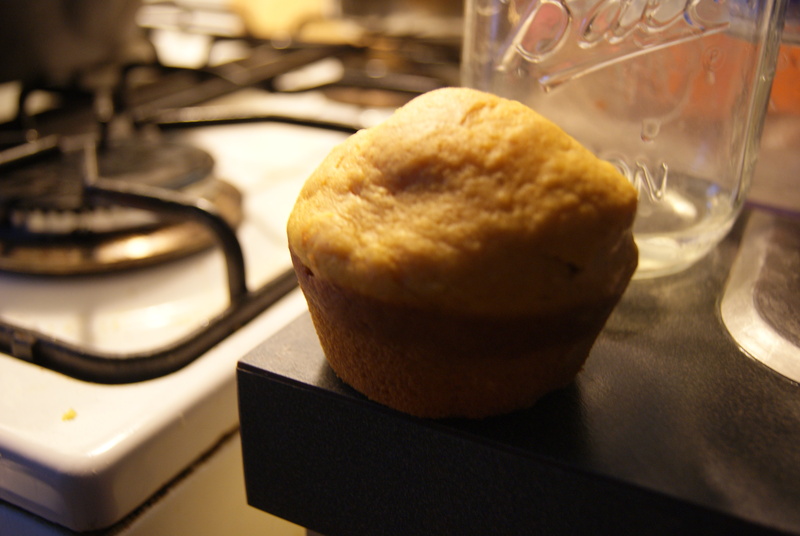 Preheat your oven to 350°F and grease a muffin or mini muffin tin. In a medium bowl, sift together flour, baking powder, salt and spices. 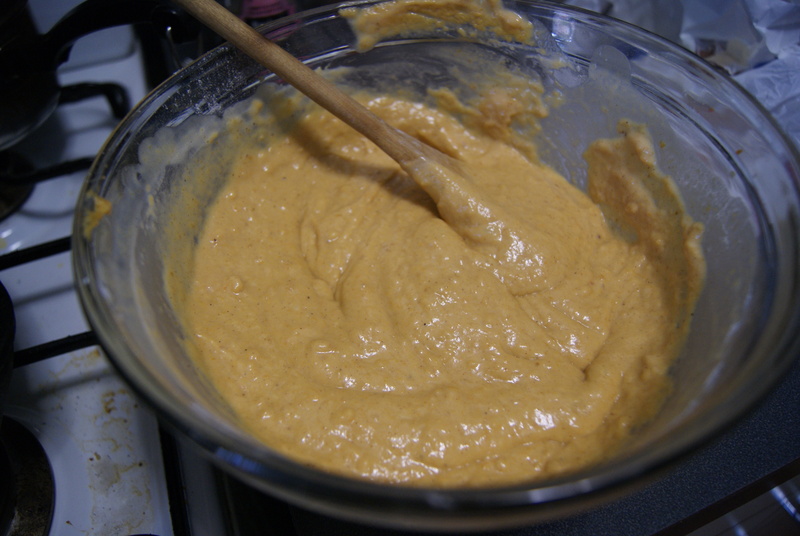 In a separate larger bowl, whisk together oil, sugar, egg, pumpkin and milk until smooth. 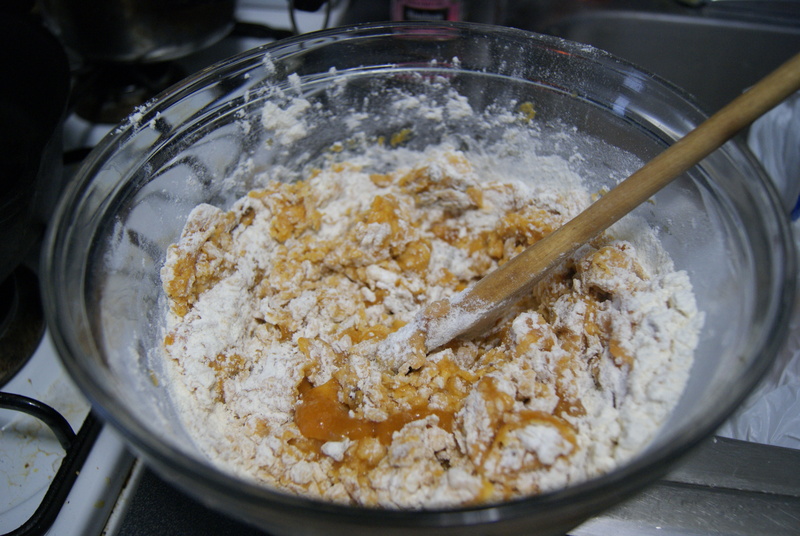 Fold the dry ingredients into the wet and mix just until combined. Like this. This is good. Divide the batter evenly among your cups and send into the oven for 10-12 minutes, or until a toothpick inserted into the middle of one of these comes out clean. Let ’em rest in the pan for about 5 minutes before taking them out to cool completely on a cooling rack. 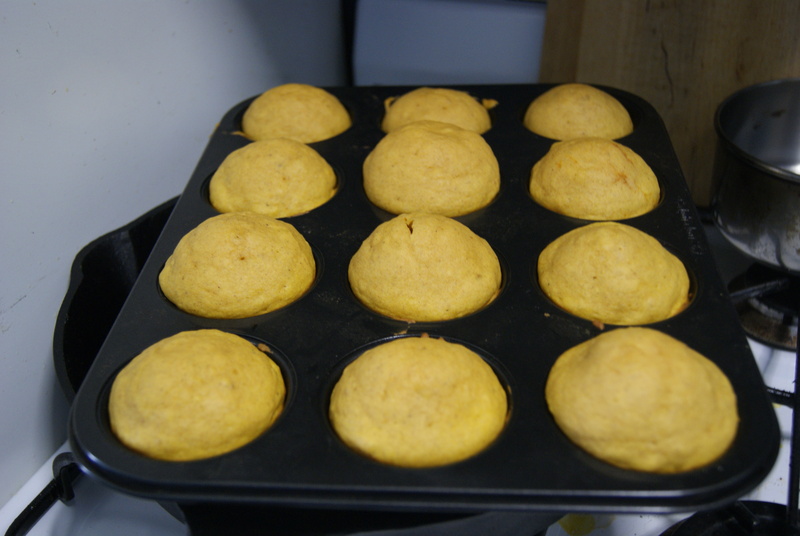 I’d initially experimented with making a pumpkin butter/cream cheese filling for these. I say “initially” because the second thing that happened after I tried to fill one was that one of these muffins kind of exploded. So… ix nay. But seriously, these things need no companions. No fillings or coatings or buttons or whatever else you’d think to dress these up with. They’re just perfect on their own…sweet, but not cloyingly sweet, with just a hint of spice to prep your brain–well, my brain– for all of the pumpkin that is to come in the next few months. Prep yourselves, readers! ← ANGRYPANTS! And Sweet Stuff Too.